I can’t believe tacos aren’t up on the blog yet, seeing as though we have them once a week, I think. But in honor of the great taco debut, I’m also including this fresh guacamole. My best friend Lucy’s father makes this incredible guacamole and it’s surprisingly simple. The first time I had it, I literally couldn’t stop eating it. It’s also best when prepared a few hours before serving, but it’s still great to whip up on a weeknight and spice up taco night (no pun intended…well, maybe a little one). In a medium skillet, brown ground beef. Stir in seasoning and 2/3 cup of water and continue cooking until water is absorbed. Heat oven to 325 and cook shells on a cookie sheet for 6 minutes to crispy. 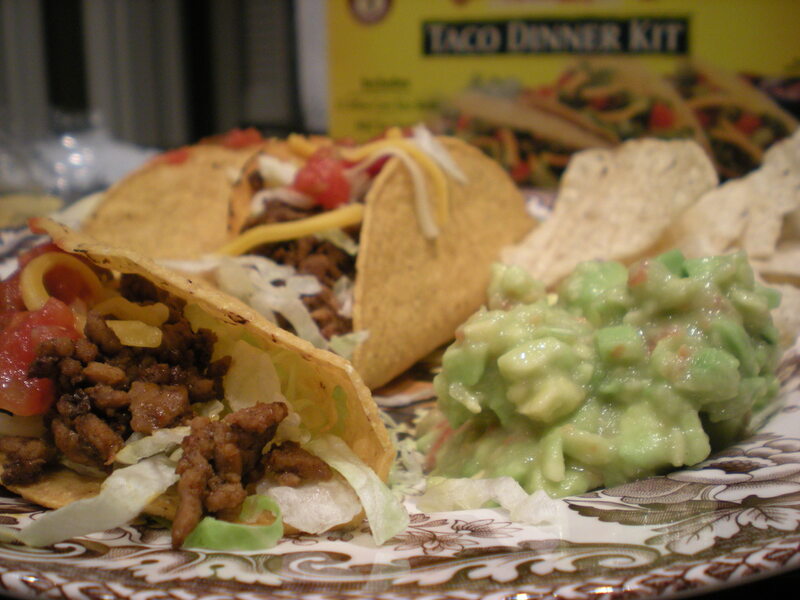 Prepare tacos with preferred toppings (tomato, lettuce, cheese, sour cream, salsa, whatever.) If we’re really hungry, we’ll heat up a can of black beans, dump a little taco seasoning into the pot, and serve on the side with a dollop of sour cream. On a cutting board, halve the avocados and pit them. Peel the skins away and chop up into small chunks. Don’t be afraid to get messy here; you want the avocados very finely chopped. Chop up tomato and onion finely as well. I use a mini food processor to get them a smoother consistently to match the avocado. Mix together. Add the juice of one lime and taste. Add a litte more juice as necessary. Add garlic salt to taste ( I used about 1/2 teaspoon.) Stir well and smooth it out with a plastic spatula. Add a little lime juice on top to prevent discoloration (avocadoes brown similar to apples when exposed to air). One of my favorite comfort foods, especially in the winter, is a big pot of spaghetti. And the good news is, my grandmother’s sauce is so simple, you’ll never use the jar stuff again, I promise. Plus, you can make the whole meal for $8. This is a super-speedy weeknight meal, especially if you use angel hair whole-wheat pasta, which cooks in just 2-3 minutes. In a large saucepan or dutch oven over medium heat, sweat the onions for about 30 seconds, then dump in the ground beef. BEGINNERS TIP: allowing the onion to ‘sweat’ means you let the heat start cooking the onion and releasing the flavor. Then, dump in the ground beef and mix well with the onion. Brown the meat, about 5-6 minutes or until cooked. Drain meat. Dump in the tomato sauce, paste and the empty paste can full of water, the mushrooms and pepper (if desired) and mix well. Then, add the oregano, good-size pinch of sugar and salt to taste. Let simmer until you’re ready to eat. The longer it simmers, the better, but it’s ready as soon as it’s hot. Serve over angel hair pasta and a green salad. And don’t forget a big class of Chianti. 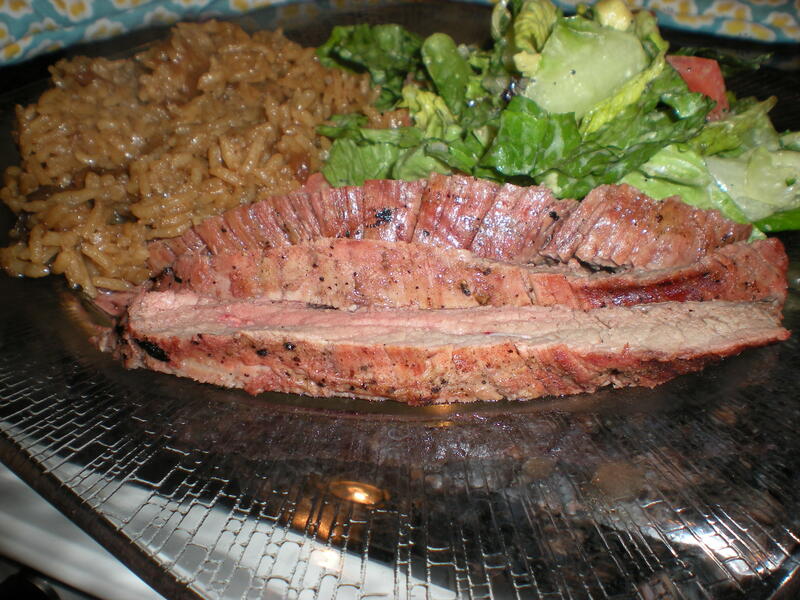 Flank Steak is a great weeknight supper — it’s a lean, healthier cut of meat and can be used to make a lot of dishes, including fajitas and stir fry. Plus, it cooks quickly. However, we also like to just grill it whole and serve in strips with rice and a salad. The trick is the marinade it for a while. I’ll prepare the marinade in the morning before work and just pull it out of the fridge when I get home and throw it on the grill. Because it’s a leaner meat, it can be tougher, so the acids and salt in the marinade help tenderize the meat. Also, placing the onions directly on the meat help to flavor it. If we have any leftover red wine lying around, we’ll also dump that onto the steak. The wine, especially if it’s a little old and vinegary, add a lot of flavor and acidity to the marinade. 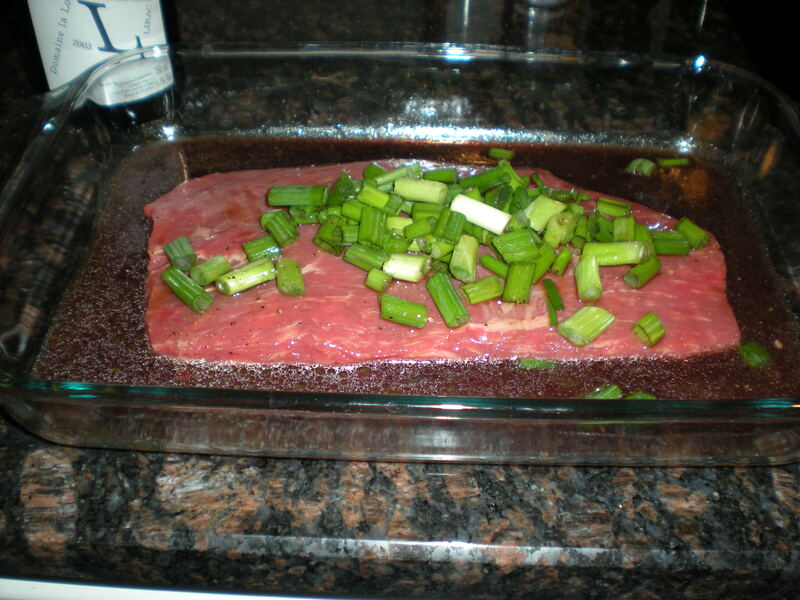 In a pyrex dish, scatter the onions over the flank steak (see photo below). In a small bowl, whisk together the rest of the ingredients, making a marinade. Pour over the steak and slightly turn the dish to make sure the marinade fully coats the steak. Cover with plastic wrap and refridgerate for up to 8 hours. When ready to grill, light the grill to 350 — 400 degrees and remove the steak from the fridge, letting it come to room temp. Grill 7-8 minutes on either side or until desired degree of donenes. Because of the lean nature of this cut of meat, you can definitely over-cook it. It’s best a little pink, medium. Let rest for about 5 minutes and then slice into strips AGAINST THE GRAIN. Serve with a salad, rice (see speedy side dishes and veggies) and a pinot noir. This recipe is adapted from my mother, who adapted it from a William Sonoma catalog (I think). It’s a simple, QUICK, perfect weeknight dinner when you’re in the mood for something hearty, though I’ve worked to make it a little healthier. You’ll need a deep skillet, or a cassoulet dish/ dutch oven because you combine the pasta and sauce together before serving. Start your pasta water and cook according to directions. Be sure and salt the water just a bit; it’s the only chance you get to season the pasta. We usually use half the box for the two of us. While your pasta cooks, sweat your onions for about 30-45 seconds over medium heat then dump in your ground beef. After the beef has cooked down a bit, add your garlic. BEGINNERS TIP: The drippings from the meat will keep the garlic from burning too quickly. If you add the garlic too soon or on direct heat without the fatty liquid, you can scorch it. Once the meat is browned (you’ll know it’s done when it’s no longer pink), drain the meat. A good trick for draining meat is to take a dinner plate and layer a few paper towels over it. Dump the meat onto the plate and the fat will drain onto the paper towel. Once absorbed, dump your meat back into the skillet. Turn the heat down to low and add your meat back to the skillet. 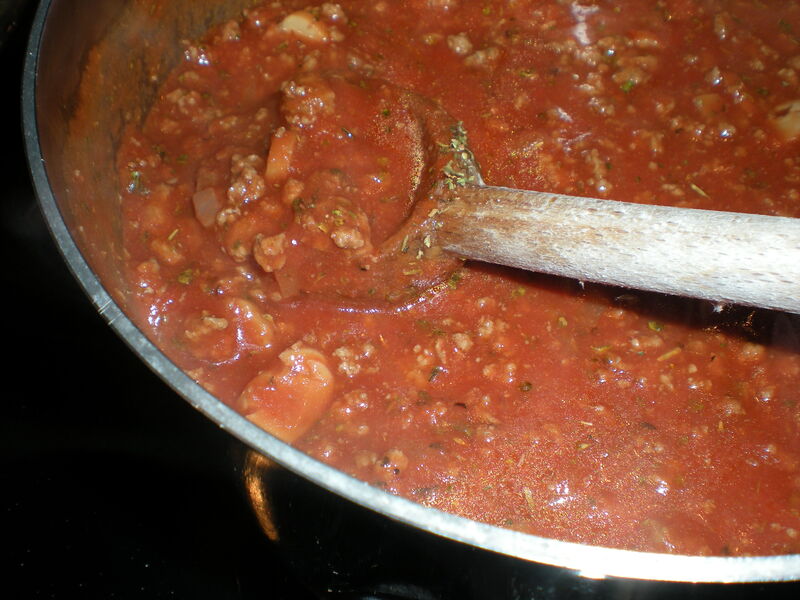 Dump in the tomato paste, milk and seasonings and stir together. Be sure and salt the meat, no matter what other seasonings you add, just a healthy shake will do fine. When the pasta is ready, drain and add it to your skillet. Stir in well and add the cheese. Use as much as you want, we typically do about three really generous pinches of it out of the tub. Serve with a caesar salad, garlic bread and a Chianti Classico. More on Chianti later…it’s a post in and of itself. OK, this is totally not my recipe, it’s Cooking Light’s (last page, August 2009 issue). But these burgers are simply incredible. Even my sister who doesn’t eat red meat wolfed these down and LOVED THEM. They take a little time to prep, not going to lie, but they are great for staying in, turning on some music and opening a bottle of red. As Fannie Flagg would say, ‘the secret’s in the sauce.’ ENJOY these. To start, get a pyrex dish out and prepare your hamburger patties (1 lb should make about 4). The trick to keeping them juicy is to LIGHTLY form them into patties, barely working the meat. Don’t pack them together too tightly. Treat them with salt and a dash of worchestershire and put the dish in the fridge for at least 30 minutes. While the burgers sit, start making the relish. Fry up the bacon slices, setting aside and crumbling them. Save the bacon drippings in a mason jar in the fridge for future cooking purposes. It’s the magic ingredient, as my mom calls it, to southern cooking. In the same pan drippings, cook down the yellow onion ribbons until they are transparent and wilted, but careful not to burn them. Cook them on lower heat, since the drippings will still be so hot. Transfer the onions and bacon to a small mixing bowl, add the chopped up chives and the Worchestershire sauce and mix that up. There’s your relish. By this point, it’s time to cook the burgers. Be sure to use a cast-iron skillet and heat up a bit of your bacon drippings to wet the pan over medium heat. When the oil is hot, but your burgers in and cook until the desired degree of doneness, about 5-7 minutes on each side, depending on thickness. Then, serve them up. Spread the sauce on both sides of the Kaiser roll and then layer the patty, relish, tomato and lettuce. Serve with roasted new potatoes and slaw. These are hearty burgers and can stand up to a big red, but try a Pinot Noir. It’s still summertime, after all!